These images of the Pacific Ocean near Indonesia were produced using sea surface height measurements taken by the U.S.-French TOPEX/Poseidon satellite. The images show sea surface height relative to normal ocean conditions during December 1996 and August 1997. The difference in sea level between these months is tied to the movement of warm water away from Indonesia. In December (left image), red and white areas indicate the presence of warm, higher than average sea level around Indonesia. At this time, massive amounts of warm water were detected around Indonesia by the TOPEX/Poseidon satellite. The warm, wet air from this water fed the normally heavy rainfall in this region. 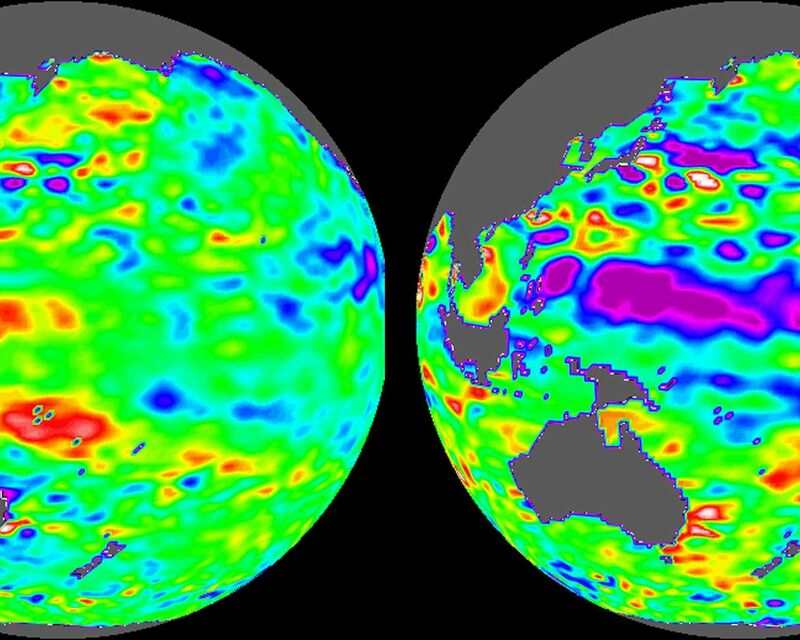 By August 1997 (right image), sea level had dropped well below average as shown by purple areas (sea level at least 18 centimeters (7 inches) below normal). The warm water had shifted east towards the west coast of North and South America, taking the rains with it. The white and red areas indicate patterns of unusually high heat storage; in the white areas, the sea surface is between 14 and 32 centimeters (6 to 13 inches) above normal; in the red areas, it's about 10 centimeters (4 inches) above normal. 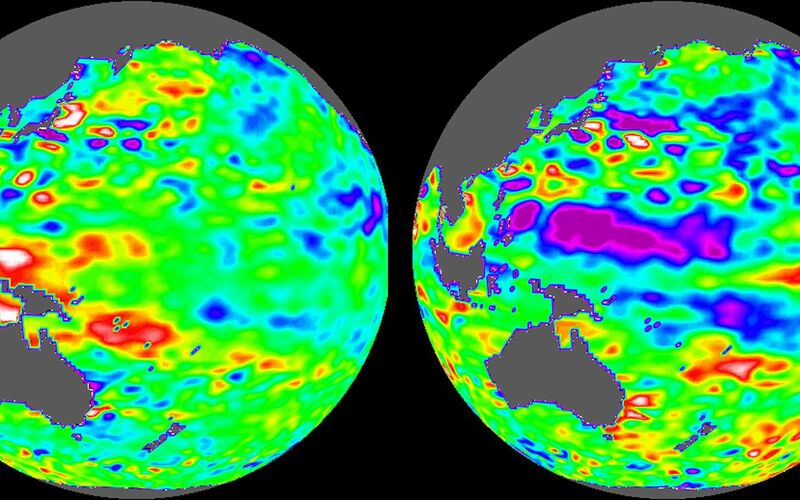 The movement of warm water away from the western Pacific is tied to the weather-disrupting phenomenon known as El NiÃ±o. The departure of the large mass of warm water that is normally located near Indonesia has affected where rain clouds form, altered the typical atmospheric patterns and brought devastating drought to Indonesia. The El NiÃ±o phenomenon is thought to be triggered when the steady westward blowing trade winds weaken and even reverse direction. Using these global data, limited regional measurements from buoys and ships, and a forecasting model of the ocean-atmosphere system, the National Centers for Environmental Prediction (NCEP) of the National Oceanic and Atmospheric Administration (NOAA) has issued an advisory indicating the presence of the early indications of El NiÃ±o conditions.